Located less than an hour from Carson City and Reno, Fallon sits at the junction of US Highway 95 and US Highway 50, both of which are busy highways. 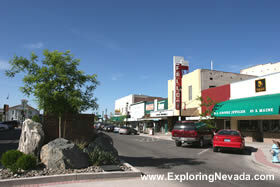 As such, the downtown area of Fallon can be a busy place. Additionally, Fallon is host to the Naval Air Station Fallon, which is the premier air-to-air and air-to-ground training facility for the United States Navy. To meet the needs of travelers and the US Military, Fallon has a fairly decent selection of lodging options in town.